Built with eco-friendly phenolic synthetic laminates of high quality and durability, Imply Official iBowling lanes are only one of the components that make the iBowling system a technology show. The iBowling Imply System provides to you the market's latest technology innovations, with the most modern and bold technology applied to Entertainment. <b>Terrestrial Multi-Functions Terminal</b> With a bold slim design, the terminals provide a modern decoration for your bowling. Its LCD Touchscreen exempts the use of a keyboard, allowing the players to access all the lane control functions through a simple touch on the screen. <b>Overhead LCD Displays</b> Flat screen 32" LCDs display the lanes score and TV or DVD images. When the lanes are closed, operators can show personalised messages - perfect for promotions, messages, and advertising. <b>LED's along the Lane</b> Lighting system with LEDs on the side of the lanes provides several visual effects that complement the Bright Bowling. <b>Bright Bowling</b> The bowling lanes are literally transformed into a show of colours, lights and music. The glow-in-the-dark pigments used on the equipment components, interact with the black lights, resulting in a great glow attraction. <b>Publicity Panels</b> Shown as the pins reset, they are a place of great visibility for all players. Ideal for advertisements. <b>Lane with phenolic synthetic laminates</b> With 10.000 cycles of resistance and Bright Bowling effect, Imply lanes look like new for many years of use. <b>Automatic Bumpers</b> Allows children and new players to have an option that makes the ball avoid the gutters. It is an option accessible from the terminals during the game. <b>New Software</b> The iBowling Imply System has the most modern software on the market. It offers: -Multi-Language System: Allows the player to select the language to command the lanes. With a touch of the screen, it is possible to choose among several languages, including English, Portuguese, Spanish, French and more. -3D Animations: At each frame, a 3D animation is shown corresponding to the score, providing more fun and interactivity. -Software with internet remote updates. -Integrated fault line: Allows an individual configuration for each player, providing more security. -Configurable screensavers: Shown when the lane is closed, can be rented for sponsors, generating an extra income. -Multiplatform compatibility: Can be installed both on Linux or Windows environments. -Personalised messages: Are scrolled at the bottom of the screen, can disclose promotions, events and company information. -Automatic Ranking: At the end of the game, classifies the players score in three categories (male, female and children). -Send torpedoes: Allows to send messages from one lane to another, or from the management central to the lanes. <b>BowlingNet System</b> Allows the owner to remotely manage their Imply Bowling Center, from any place of the world through the Internet. With this system, the owner can view the income of each lane or from all of them. It allows to see in real time which are the open lanes, and other useful information. <b>Management Central</b> Besides managing the Imply bowling lanes, it allows you to control other equipment, such as snooker tables, video games, cybercafe, and others (optional). <b>Maintenance</b> Imply Bowling Equipment is developed to require minimum maintenance. Besides, the operation is facilitated by the use of market standard technologies, such as TCP/IP, Ethernet networks, multiplatform software (Linux or Windows), and modularity and plates connections, with remote updates via Internet and total telephone support. Imply Equipments are recognised with CE certificates, following international quality standards. <b>Bowling Lounge Furniture</b> The Imply Bowling Lounge furniture line is designed to create a lounge atmosphere, providing greater comfort to your customers and maximising the time they spend in your center. Built with eco-friendly phenolic synthetic laminates of high quality and durability, Imply Official iBowling lanes are only one of the components that make the iBowling system a technology show. The iBowling Imply System provides to you the market's latest technology innovations, with the most modern and bold technology applied to Entertainment. 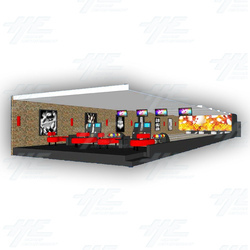 With a bold slim design, the terminals provide a modern decoration for your bowling. Its LCD Touchscreen exempts the use of a keyboard, allowing the players to access all the lane control functions through a simple touch on the screen. Flat screen 32" LCDs display the lanes score and TV or DVD images. When the lanes are closed, operators can show personalised messages - perfect for promotions, messages, and advertising. Lighting system with LEDs on the side of the lanes provides several visual effects that complement the Bright Bowling. The bowling lanes are literally transformed into a show of colours, lights and music. The glow-in-the-dark pigments used on the equipment components, interact with the black lights, resulting in a great glow attraction. Shown as the pins reset, they are a place of great visibility for all players. Ideal for advertisements. With 10.000 cycles of resistance and Bright Bowling effect, Imply lanes look like new for many years of use. Allows children and new players to have an option that makes the ball avoid the gutters. It is an option accessible from the terminals during the game. Multi-Language System: Allows the player to select the language to command the lanes. With a touch of the screen, it is possible to choose among several languages, including English, Portuguese, Spanish, French and more. 3D Animations: At each frame, a 3D animation is shown corresponding to the score, providing more fun and interactivity. Software with internet remote updates. Integrated fault line: Allows an individual configuration for each player, providing more security. Configurable screensavers: Shown when the lane is closed, can be rented for sponsors, generating an extra income. Multiplatform compatibility: Can be installed both on Linux or Windows environments. Personalised messages: Are scrolled at the bottom of the screen, can disclose promotions, events and company information. Automatic Ranking: At the end of the game, classifies the players score in three categories (male, female and children). Send torpedoes: Allows to send messages from one lane to another, or from the management central to the lanes. Allows the owner to remotely manage their Imply Bowling Center, from any place of the world through the Internet. With this system, the owner can view the income of each lane or from all of them. It allows to see in real time which are the open lanes, and other useful information. Besides managing the Imply bowling lanes, it allows you to control other equipment, such as snooker tables, video games, cybercafe, and others (optional). Imply Bowling Equipment is developed to require minimum maintenance. Besides, the operation is facilitated by the use of market standard technologies, such as TCP/IP, Ethernet networks, multiplatform software (Linux or Windows), and modularity and plates connections, with remote updates via Internet and total telephone support. Imply Equipments are recognised with CE certificates, following international quality standards. The Imply Bowling Lounge furniture line is designed to create a lounge atmosphere, providing greater comfort to your customers and maximising the time they spend in your center. The factory will provide installation at no cost, however the purchaser must cover the cost of flights, meals and accommodation for two technicians during the installation period (approximately three days per lane). The purchaser must also provide one assistant for the installation.